This 17th century grade II listed chapel was built in 1612 by Sir James Altham as a private chapel for his family and staff living at Oxhey Place. It was said to have been used as a store and barracks during the Civil War by Cromwell’s Parliamentary Army after the Battle of Uxbridge. The soldiers damaged the chapel, taking lead from the roof to make Musket balls and created a new door in the East wing. This door was eventually blocked in 1688 by Sir John Bucknall the then owner of Oxhey Place. The chapel was used a place of regular worship until 1799, when it was used chiefly as a storage for lumber. 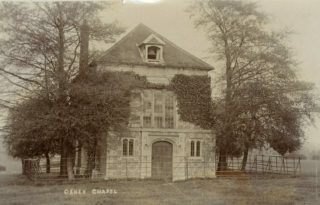 The chapel was restored in 1897 at the expense of Mr. T. F. Blackwell. During the 20th century the chapel again fell into disrepair and in the winter of 1962–63 part of the roof fell in. Although repairs were carried out, including a complete replacement of the roof and the bellcote, the chapel was eventually declared redundant in 1977. The chapel can still be visited and is still consecrated and is used at times for weddings. This page was added on 18/03/2011.